In Hinduism, the Lord Krishna is considered a supreme God, one of the most widely revered and most popular of all Indian deities. 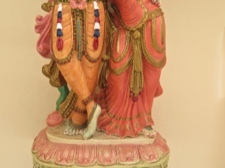 His great love was Radha, a Hindu goddess devotee. 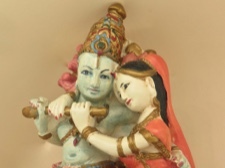 Their love was symbolic of the loving interplay between God and the human soul. 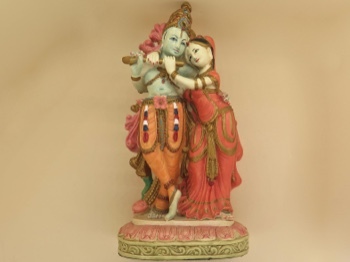 Radha's utterly rapturous love for Krishna and their relationship is often interpreted as the quest for union with the divine. This spiritual love became a theme celebrated throughout India. 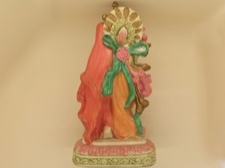 This delightful figurine is a handpainted bonded stone casting that stands 7 inches tall. Its base is 3.5 x 2.5 inches. May this loving union remind you of joyful and devotional love.